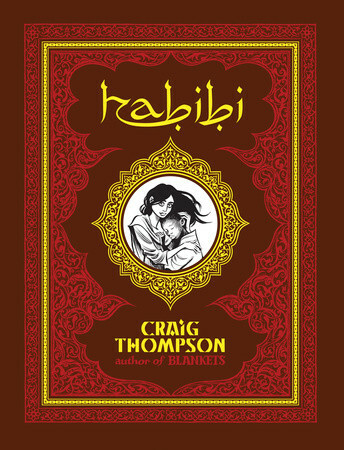 Craig Thompson's Habibi starts off strong right out of the gate. The opening scene sets a distinct mood that stays with you throughout the book and sets the stage incredibly well. Everything after flows naturally from the opening pages and helps form the powerful story told throughout the pages. As with his previous graphic novel, Blankets, Thompson is able to balance an interesting story of relationships and religion. Habibi adds one more layer on with a cultural perspective that works wonders. Thompson's illustrations work brilliantly for the feel of the book. His inkwork perfectly translates to his arabic writing just as well as his slightly cartoony figures create a wonderful canvas for emotion and empathy. His page layouts create a great sense of movement and are graphically designed almost to perfection. His full page spreads show high-points of the story and due to their presentation create the feeling as soon as you take a glimpse after turning the page. The story provided in Habibi, as said above, is a wonderful look into culture, religion, and relationships. His comparisons and tales from the Bible and the Quran create a nice parallel to the overall story unfolding as well as creating a nice cyclical pattern utilizing the storytelling theme throughout the book. Dodola and Zam's relationship is powerful and engaging as you watch the two grow up through difficult times into difficult times as their relationship is tested and confronted.